Farmhouse in the Algarve to rent, 25% discount now! Quinta Bem Posta is a farmhouse in the Algarve, only 5 minutes from the beach of Alvor, that has some weeks left in October. We give 25% discount. Week price is 750 euros. The Algarvian Farmhouse, sleeps up to max 12 persons, divided over a main house, annex and garden house. All located in a fenced garden, only 5 minutes drive from lively Alvor, with white stretched sandy beaches. A large private pool, plus shallow children’s pool, in a very large, landscaped garden. Beautiful covered terrace with ample seating, all set up for outdoor living, with nice BBQ area. There is a game room with among others dart and table football, and an outside tennis and basket ball area. We have some weeks left, and we will rent them for only 750 euros! Please visit our website for more information, or contact me. 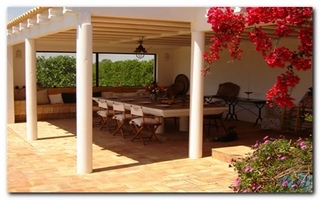 Algarve Housing is happy to tell you that we have a very nice, rustic country side villa on our books. The holiday villa located in the East of the Algarve, discover the East of the Algarve, with nice villages like Olhao, Tavira, Fuseta, and book your holiday in the Algarve now, and enjoy the piece and quiet of Quinta Rustica, in combination with the luxury of a large private Jacuzzi, private pool, sauna and Gym! Quinta Rustica is a wonderful country house, located just outside Olhao, (only 20minutes east of Faro) and has accommodation for up to 10 lucky guests. This property sits in a quiet valley dotted with Almond, Carob, Cork and fruit trees and is only a 10 minutes drive from Ria Formosa Nature Reserve, where you can enjoy kilometres of white long stretched sandy beaches, wild dunes and turquoise waters. Traditional fishing town Olhoa (15mins drive) with its picturesque cobbled streets, Moorish architecture and daily fish and fruit market (best in the Algarve!). From your doorstep, many trails to walk in the ‘Barrocal’ hills infused by thyme and lavender. Plus many world class golf courses located just minutes away. The house is typical of this region with thick lime-washed stone walls with timber and cane ceilings. It boasts a large kitchen and dining area with all of the usual equipment (fridge, freezer, gas hob, micro-wave, dish washer, electric oven and washing machine), a lounge with a wood burning stove, satellite TV, DVD, CD and stereo. There is the meditation pavilion, with double bed and has an outdoor bath and shower. Next to the pool is a ‘plancha’ with outdoor kitchen with fridge and stereo. All in this entire holiday villa makes the ideal getaway for a large family or groups of friends. Discover the Eastern Algarve, and book now your holiday villa and enjoy Quinta Rustica! Algarve Housing rent more villa’s, in different parts of the Algarve, please visit our website and contact me for more information. This nice villa, located in the hills of Monchique, has 4 bedrooms, 2 bathrooms, private pool and private separate Jacuzzi. Two air conditioning units to keep you cool (additional costs). Uninterrupted views over the hills, quiet location, but only 15 minutes to shopping centres of Portimao and 20 minutes to beautiful, white sandy beaches on the South Coast, as well as the West Coast! Get the best of two worlds with Quinta Eucalyptus, and book now your ideal holiday home! Algarve Housing rent more nice villas, please visit our website and have a look around. Subscribe to our blog to keep updated about Special Offers of Special Holiday Homes in the Algarve. Alvor, close to Lagos has a wide, fine sandy beach, one of the best in the Algarve. Algarve Housing rent very special villas in the Algarve, the most southern part of Portugal. One of our special villas is Quinta Bem Posta, close to Alvor. Due to Alvor’s peculiar and sensitive ecology, attempts have been made to protect the surrounding area from tourist development, which have only been partially successful. Alvor has, however, managed to retain much of its original style, with low buildings and open surroundings and the lagoon, which is a specially protected area of natural beauty. The area around the old fishermen’s market has been developed greatly over the past five years. It now has a wide waterfront promenade, with restaurants and bars where one can sit and watch the fishing boats. Behind the fish market is the old lifeboat station, which is well worth a visit. Alvor’s main beach is just five minutes’ walk from the town. A favourite among windsurfers, it is four and half miles of wide open sand, offering enough space for beach volleyball, football, frisbee and walking. The beach is backed by dunes and has plenty of facilities. There are usually life guards on duty and sun umbrellas and sun loungers can be hired at a daily rate. Car parks are close to the beach. Several beach restaurants offer traditional grilled fish, lamb, piri-piri chicken and other delicious foods. The beach is popular with Portuguese holidaymakers from the north who usually arrive in the Algarve in September, but due to its size Alvor Praia is never packed. Tres Irmaos Beach, further east, is mostly backed by cliffs, with huge rocks scattered along the shoreline. It leads to Praia da Vau and Praia da Rocha. “Praia” is the Portuguese for “beach”. Remember that Alvor is still a fishing village, talk to locals and find out what time the fisherman return from the sea. It’s well worth getting up early and watching them work with their catch. The Octopus is a real speciality. Algarve Housing rent nice holiday homes in the Algarve, and also near Alvor with its wide, sandy beach! Quinta Bem Posta is only 5 minutes from Alvor. Contact me for availability and more information. We regularly write articles about our holiday properties, special offers, information about the region and Things to do in the Algarve. If you don’t want to miss it, subscribe to our News Blog, and keep updated! Get ready for sun, sea and sand! Book Quinta Palmeiral. There are some holiday destinations which just get better each year, exceeding expectations and providing every member of the family with a truly memorable break. This year, why not holiday in style in the Algarve’s Portugal and avoid cramped hotel rooms, noisy neighbours and busy pools, by taking your own private villa where you can relax in peace and enjoy your holiday exactly as you dreamed. AlgarveHousing is sole agent for holiday home: Quinta Palmeiral. Set in the one of the highest points of the ‘Serra do Algarve’ with Panoramic views across rolling hills to the Atlantic Ocean. Pure, Portuguese, rustic elegance, in a very luxury style, that is what Quinta Palmeiral offers. Re-built farmhouse, externally exactly as it was, to the finest details. Inside built to the most exacting, modern standards, including under-floor heating and cooling. Tall French Oak doors, pole and cane ceilings. Quinta Palmeiral is a very private residence, overlooked by no one, yet is an easy reach of all you need. By car, Loule is 5 minutes and Faro Airport 20 minutes. Two en-suite bedrooms, 1 double, 1 twin, with fitted wardrobes; a well equipped kitchen, open dining and lounge area. All decorated and fitted to the highest standards. The high level terraces have views across the gardens to the south and west. Tiered steps take you to through the fruit tree garden to the formal lawn below. Adjacent to the main house is a large terrace under a suspended pergola with three rooms designed to service the pool areas; a kitchen, a shower room including drench shower, a steam room and a large services and store room. A great place to start and finish your day! All overlooking the private gardens and infinity pool, and breathtaking views. Please contact me for more information, availability, tailor made quote and pictures. Get ready for the sun, sea and sand and book this beautiful restored farmhouse Quinta Palmeiral now! Don’t miss any news, latest offers, information about the area of one of the holiday homes of AlgarveHousing, and subscribe to our blog.